Many customers have asked us for an oil-absorbent powder. 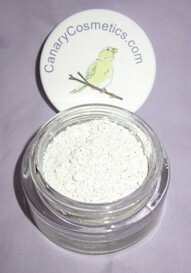 We have redeveloped Feather Light Powder to be more oil absorbent for those with oily skin. It is a white powder blended from cosmetic-grade kaolin clay and mica. We have added the soothing and highly absorbent kaolin clay with the most absorbent mica available for long-lasting oil control. Other companies that have similar products use plant-based starches that require the addition of preservatives. Our blend uses only minerals so that no irritating additives are required. The best way to use Feather Light Powder is to put it on first with a sponge over moisturizer. Then layer your usual color of Canary Mineral Foundation over the top. This will give the best oil absorbency and natural color. Any needed touch-ups are best done with your usual color foundation. You can also add the feather light powder to your usual foundation powder for a one layer application. Your regular color will be lighter when adding the feather light powder. Some people prefer to use the powder over the top as a setting powder. While it is possible to use the powder this way, we caution you to use it very lightly or you will have a white ghost-like appearance. Feather light powder comes with a sponge.